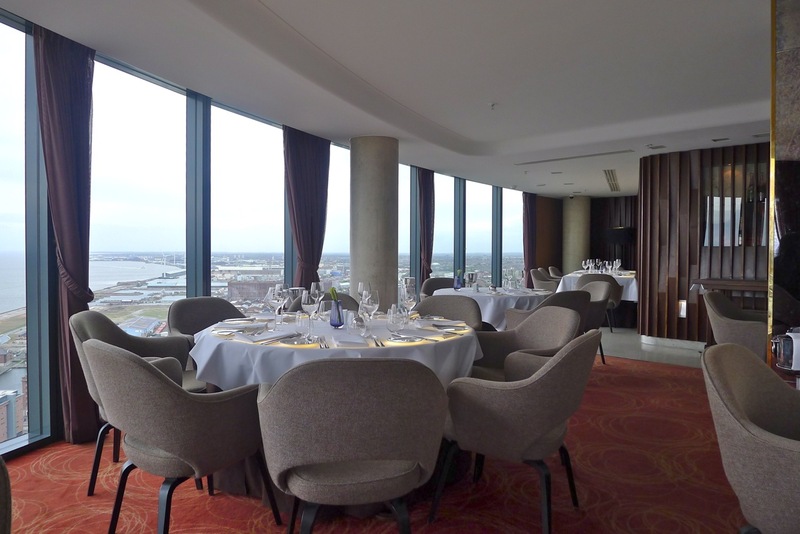 The Michelin guide states that the Panoramic restaurant offers ‘formal service’ and ‘intimate dinners’ in ‘a stylish glass skyscraper with 360° views.’ All true, but when the best and most memorable part of a meal (as it was for myself) is the view, it doesn’t bode well for the food. 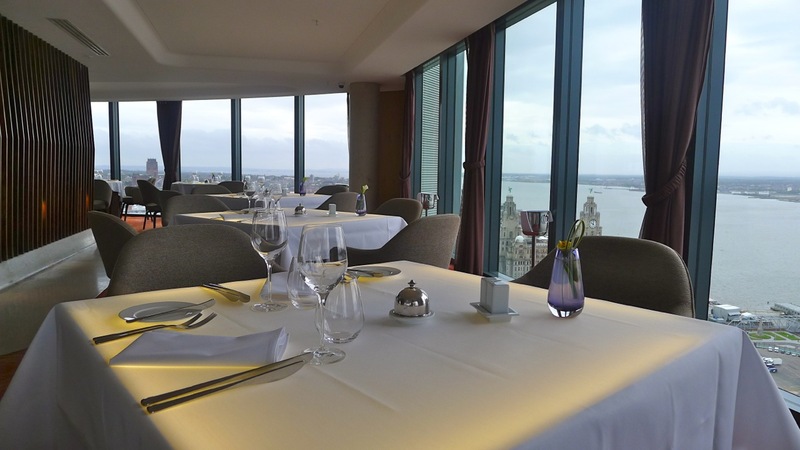 Billed as Britain’s tallest restaurant, Panoramic is located some 100m above sea level on the 34th floor of Liverpool’s highest building, the West Tower. On a clear day it is said that you can see the Welsh mountains in the south, Blackpool Tower to the north and views across five counties, including the Beetham (Hilton) Tower in Manchester. 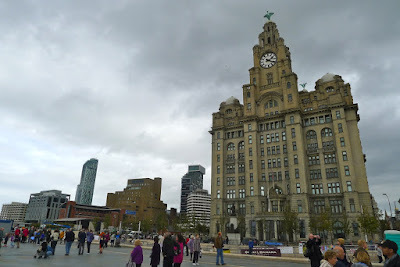 Sadly, it was not a clear day. 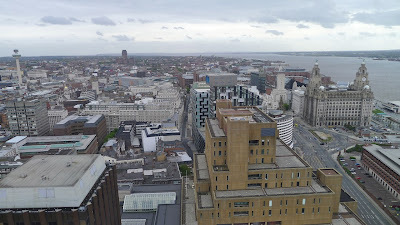 Radio City Tower to the left, the Royal Liver Building and River Mersey to the right. We did however have great views of some of Liverpool’s famous landmarks, both old and new. Including the Radio City Tower (that in the 1960s had it’s own high rise and revolving restaurant! 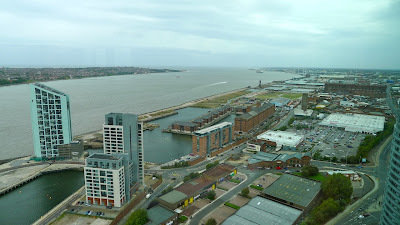 ); the Royal Liver Building; Albert Docks and the River Mersey, complete with ferries. 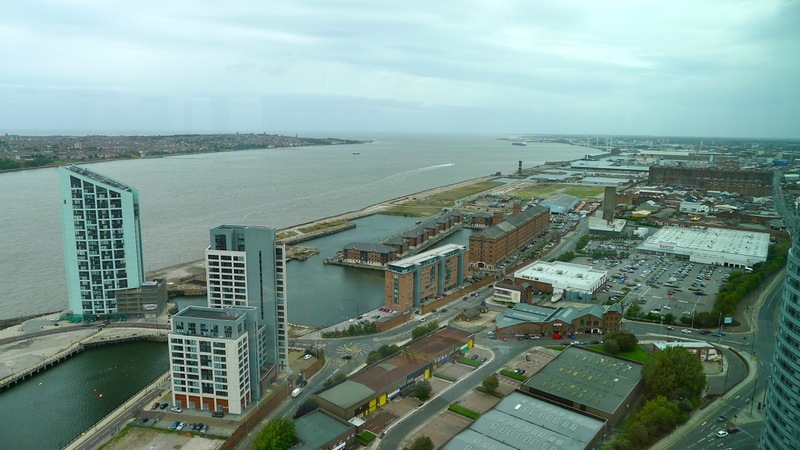 View towards the Mersey estuary. 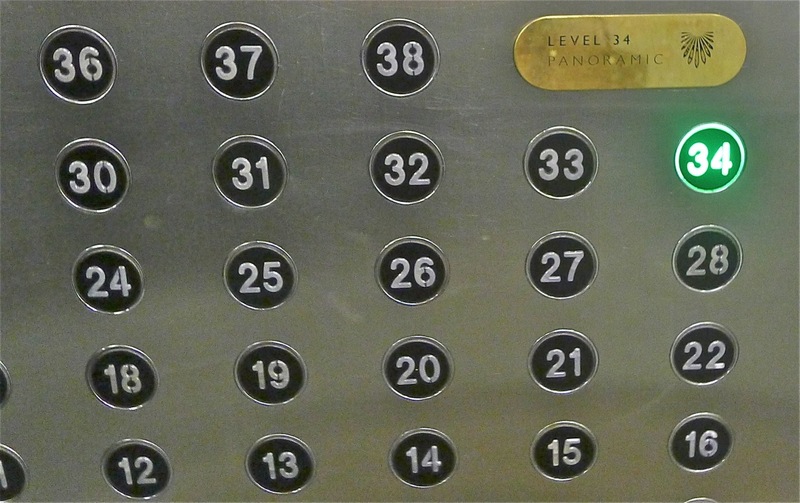 Being close to 400 feet up, I did not fail to observe that we were dining on the tenth anniversary of the 9/11 terrorist attacks on the World Trade Centre’s Twin Towers. My father once dined in the 107th floor Windows to the World Restaurant and a number of my former colleagues from Sedgwick PLC (who had relocated to the US when the group was acquired by Marsh & McLennan) lost their lives when American Airlines Flight 11 crashed into their offices in the North Tower. Subsequently, this was quite an emotional meal for me and I so wanted to enjoy the experience. 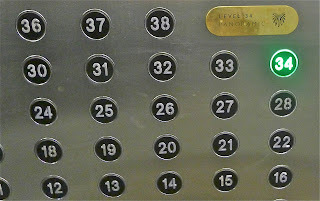 Despite only opening in 2008, I felt the dining room was a little dated. With the mustard coloured leather studded walls, brown voiles, umbers, marble columns, wood paneling and up lit tables, it reminded me of a baddies lair from a seventies James Bond film. 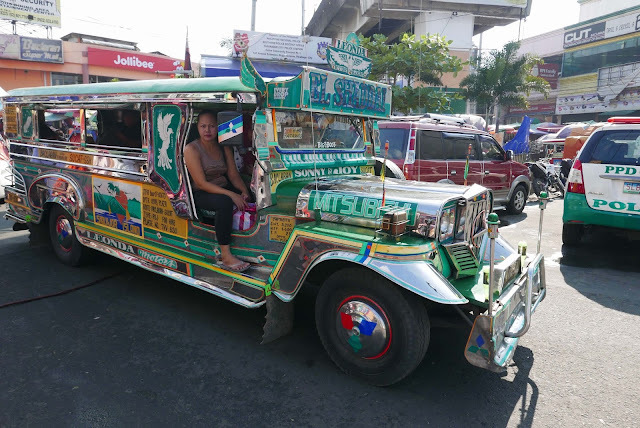 Maybe this is the retro look they were going for? On arrival, we were presented with a single sheet set lunch menu (reasonable at £20.50 for 3 courses). 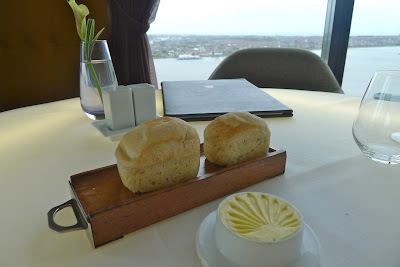 Having made our selections we were presented with two uneven breads. Naturally, I scoffed the larger, leaving the smaller one for my wife. The breads were very good with an airy texture. Sadly, we were only served one each during the course of the meal and with rock solid butter – albeit, with the restaurants logo dinkily embossed. 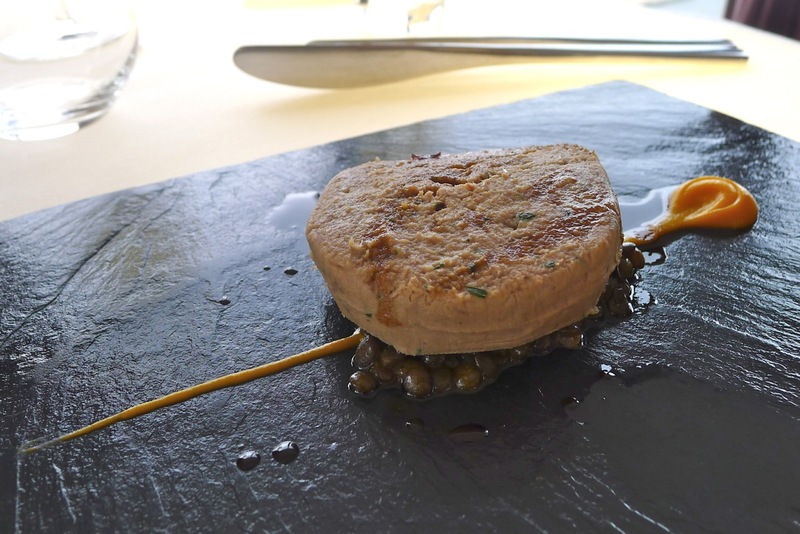 Ours starters arrived very quickly, my wife’s Gressingham Duck and Foie Gras Terrine, Carrot Puree with Spiced Puy Lentils was a rich and tasty dish. Flavour aside, I felt it looked a little like cat food – of course, not wanting to put her off, I didn’t say this as at the time; although, on the way home my wife did make the same comment. 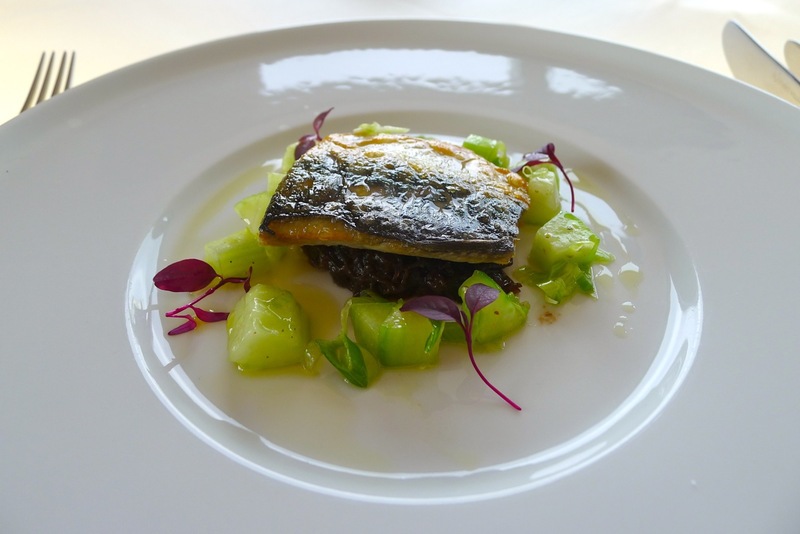 My starter, the Mackerel, Red Onion Marmalade with Pickled Cucumber was a colourful and eye-catching dish. On the plus side, the mackerel and onions were very flavoursome and well cooked. More negatively however, the ‘pickled’ cucumber - texturally, they added a great crisp crunch but I failed to detect anything but the subtlest acidity. Another negative was the portion size; this wouldn’t have been so bad if this had been part of a tasting menu or if I had been offered another bread. 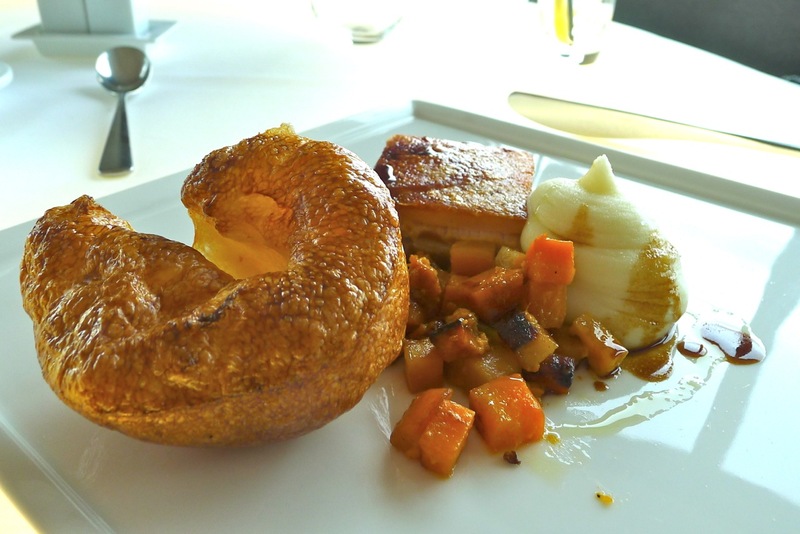 My wife’s chosen main was the Pork Belly, Roasted Root Vegetables, Mashed Potato with Yorkshire Pudding. She sung the praises of the smooth and creamy mash and root vegetables. The small square of pork was not a generous serving though it was of acceptable quality. The crackling, despite looking crunchy was a little tough and ‘claggy’ to eat. The biggest disappointment happened to be the biggest thing on the plate, an attractive looking but dry Yorkshire that was crying out for gravy! 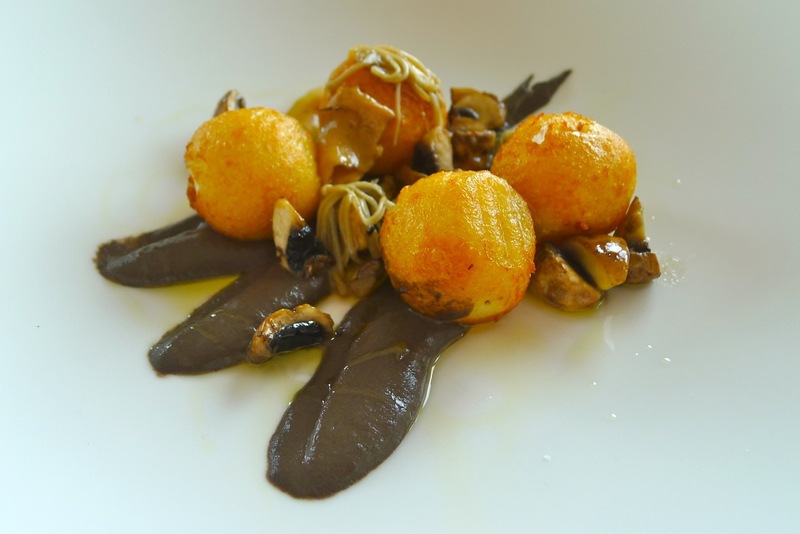 My chosen main was the Parmesan Gnocchi, Mushroom Puree with Wild Mushrooms. Sadly, another dish that just seemed to lack the desired quality. The gnocchi were a pleasing texture but lacking in Parmesan flavour, surprising for such a usually dominant cheese. Thankful that the tide was in, I’m not sure if I could have eaten the mushroom puree whilst looking out across the mud flats. When I closed my eyes, I enjoyed the flavour but found the ‘mud’ and ‘slurry’ like appearance very unappetising. 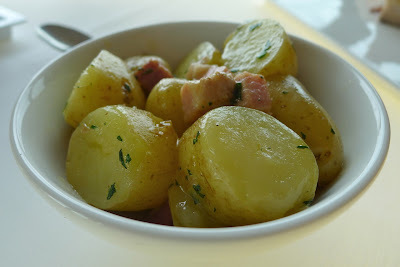 To accompany my main, I also ordered a side of Ratte Potatoes with Smoked Bacon. This simple dish was one of the best and certainly most filling parts of the meal. 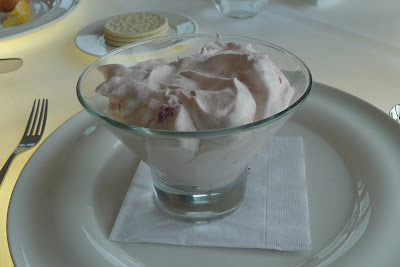 For her dessert, my wife chose the Summer Berry Eaton Mess - a big plus for the fresh raspberries, strawberries and plump blueberries; the tiny, tiny pieces of meringue being the major let down. To me, it seemed like a fruity angel delight. For my own dessert I was torn between the Chocolate Truffle Cake and the Plated Cheese Selection. 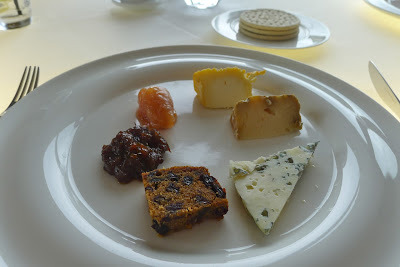 I opted for the cheese on the strength of the listed condiments: a Tomato Chutney, Quince Sorbet and Pickled Carrots, especially the latter two. The quince sorbet did not let me down and was one of the nicest things I ate all day. I hoped the ‘pickled carrots’ would be ‘picklier’ than the disappointing cucumbers – they turned out to be less ‘pickly’ and even less ‘carroty’, in fact, they had a flavour much more reminiscent of a dry fruitcake. 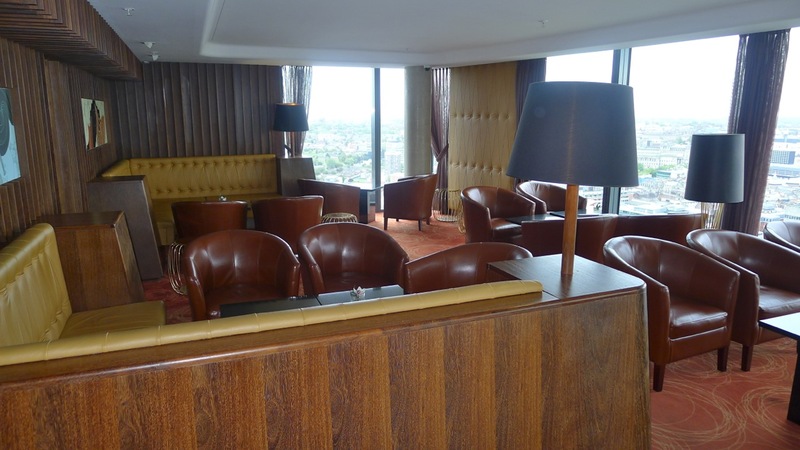 The lounge and bar area. 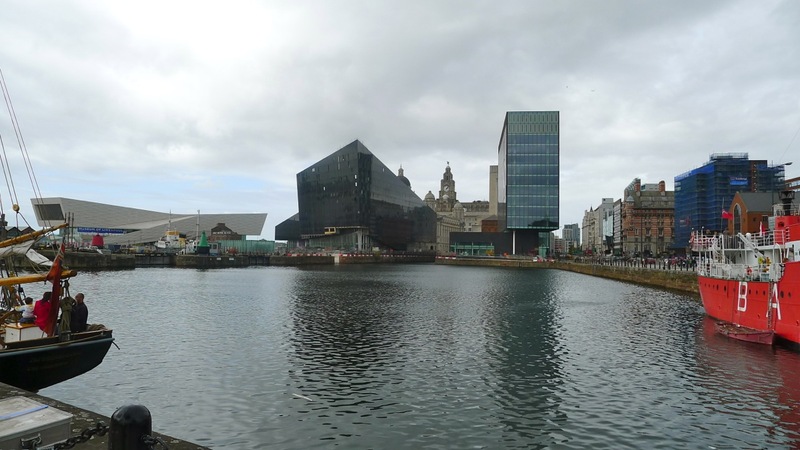 The new Museum of Liverpool and the Mann island Buildings. 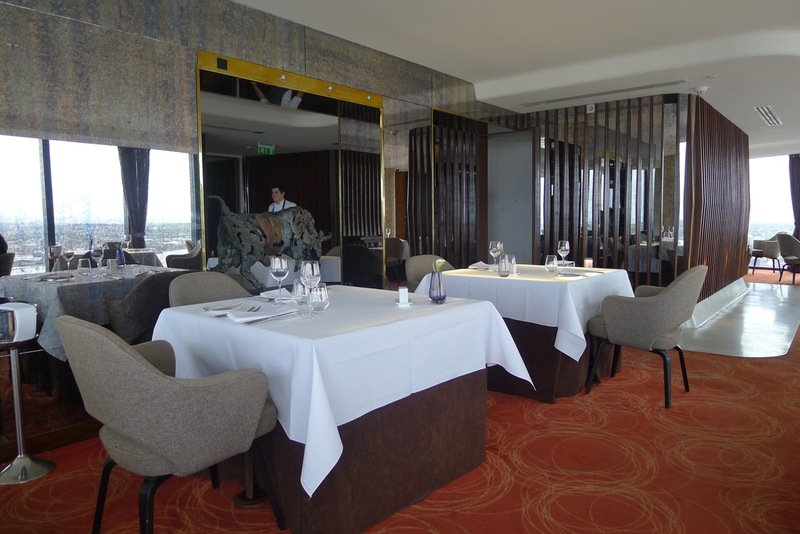 Service was overall good and despite the little niggles the lunch menu is good value. The views are truly breathtaking; my simple summary would be, go and expect to be wowed by the views but not the food. 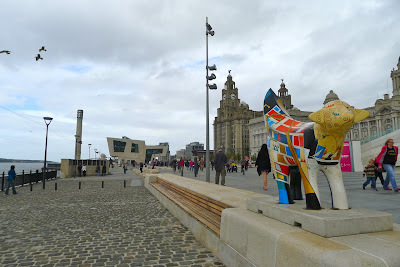 Liverpool is an amazing city with some fabulous museums, galleries and of course the Beatles connection – it’s just a shame that Panoramic did not live up to my expectations. You can see the West Tower to the left of the Royal Liver Building. I had a very similar meal there when it first opened, some good ideas and at times good technique, but not nearly enough attention to detail. Most of the dishes just didn't come together as a whole. It appears that it hasn't changed much. 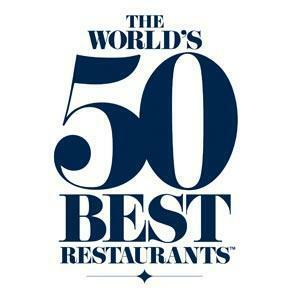 I haven't been back since, as its evening menu is quite expensive, and it can not justify the cost. Judging by your review I wont be going any time soon. 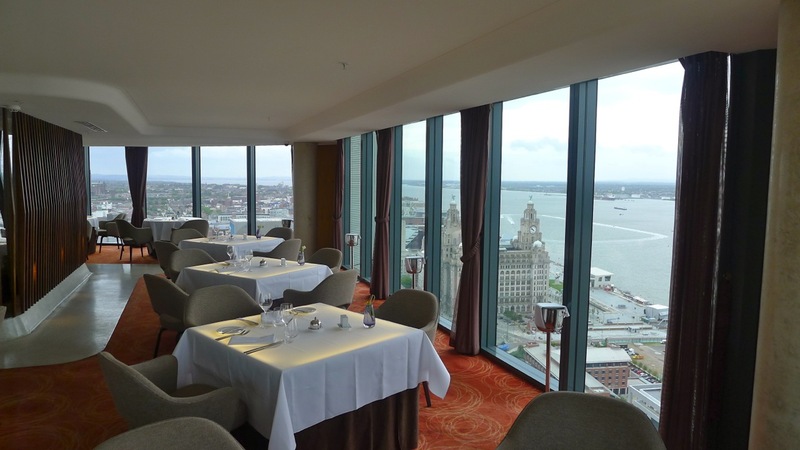 Its another in a long list of fine dining failures for Liverpool.